Tel Megiddo - Photo provided by Michael Novins. 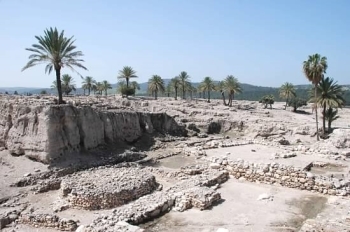 The Biblical Tells and Ancient Water Systems -- Megiddo, Hazor and Beer Sheba are representative of tells that contain substantial remains of cities with biblical connections. The three tells also present some of the best examples in the Levant of elaborate Iron Age, underground water collecting systems, created to serve dense urban communities. Their traces of construction over the millennia reflect the existence of centralized authority, prosperous agricultural activity and the control of important trade routes. Tels are hills or mounds created over centuries by communities building over the ruins and refuse of the previous structures. Archaeologists often liken tels to a layer cake with each layer being a different period of time. As the mounds grow, they usually become narrower, which eventually leads to a shrinking of the population, and eventual abandonment of the tel. This process, however, can take centuries. This world heritage site consists of three different tels in different parts of Israel. While there are many archaeological tels in Israel, these three were chosen for World Heritage status because, 1) they all have at least a brief mention in the Old Testament, and 2) they all have extensive human-built water systems. The water systems for all three tels are quite impressive and not obvious when you first arrive at the site as they are underground. I visited all 3 of the Biblical Tells during my 2016 trip to Israel. By far the most heavily excavated and visited is Meggido. Given its association with the Book of Revelations, it gets many religious tours who stop here on the way to Galilee. Ber Sheeba is very close to the city of the same name and gets many school groups. Hazor is the furthest away from anything and gets the least number of visitors. Tel Megiddo, one of the three Biblical Tells (basically towns built right on top of each other over the span of hundreds to thousands of years, forming a mound) inscribed on the World Heritage List, is a deeply excavated site rich in history. I visited this tell in February 2015 as part of group tour of Israel with my church, and it was fascinating to see how much archaeological work has been done there. Because I was on a group tour, we didn't have time to tour the site individually, nor was there much discussion about the Bronze-age history. However, we did learn about the association many archaeologists have made of this site's growth during the reign of King Solomon, to include the installation of stables. We also walked through an ancient city gate en route to the top of the hill, to get a better understanding of the tell's strategic placement between the coast and the interior of the country. This advantageous location has led to battles in Biblical times and in more modern times--almost 100 years ago during World War I. Although I didn't get to see any other tells on the group tour, Tel Megiddo was an amazing site to visit. 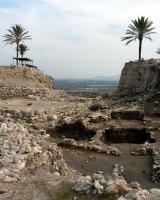 Logistics: Tel Megiddo can be visited by private transportation or as part of a group tour. Although this WHS has three locations (in different places of Israel), I visited only one – Megiddo. Megiddo is located in the area full of World Heritage Sites, around 40 km from Haifa, if I remember correctly. Visiting Megiddo may be easily combined with another WHS – Necropolis of Bet Shearim. The site was firts settled around 9 thousand years ago and became an important point for all groups wanting to control Lower Galilee, such as Egyptians, Kanaans and of course Jews. It is traditionally identified as apocalypic Armageddon, where the final battle between Good and Evil should take place. The site is very well preserved and even for those not interested in archeology, when the weather is good it is a picturesque place worth seeing. Most of the walls, gates, observation points and stables remained in a relatively good condition so it is not difficult to imagine how the town looked like in the biblical times. I was particularly surprised with underground water supply system, which made Megiddo practically self-sufficient during the siege. 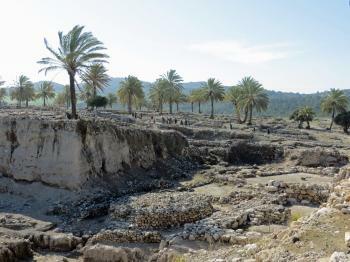 Overall, from several archeological places I have visited in Israel, I found Megiddo the most interesting. We visited all 3 Tels and didn’t find the “duplication” excessive – indeed the similarities and differences which emerged were of benefit in understanding the entire nomination. We gave Megiddo just over an hour – but ideally it needed more. Like the previous reviewer we came up against the “dragon at the desk”! We were early enough to get in but it was Shabbat and it was made clear that, even if the official closing time was 3pm, they really wanted us out at 2.45. Also the Water Tunnel closed at 2.30. Hazor took 50 minutes (but the water system unfortunately was closed because of roof falls – who knows when it will reopen). Finally, Beersheba took about an hour – but that was extended by our conversation with one of the young volunteers working on the site. a. Megiddo. If you can only see 1 then this I guess is the one to see. In fact its most important aspects are those of a Bronze Age Canaanite city and the later Israelite remains are much less significant. The Water system which we had to rush to see consists of a 70 metre long tunnel down some 30 metres of steps. The “visit” is designed such that you exit the tunnel by a lower series of steps just beyond the Tel where you leave the site altogether to be picked up by your tour bus which will have driven to await you!! Alternatively you walk along a road outside the site back to your car. Neither of these options suited us at all as we wished to make full use of our constrained time by revisiting all the site’s elements so we returned along the tunnel and re-climbed the deeper steps! Another noteworthy aspect of the site is the enormous “cut” created by the Rockefeller-funded excavations of the 1920s/30s (Photo). This was "industrialised" archaeology! b. Hazor. This is primarily another Bronze Age Canaanite site with some Iron Age Israelite elements. One element of note is the Canaanite (??) Cultic area with its stelum or “Massebah” (“You shall not erect a massebah that Yahweh your lord hates" - Deuteronomy 16:22). I would be interested in anyone commenting on the Forum about the Bible’s attitude towards “Masseboth” (plural!) as, from my limited investigations and understanding, it seems rather contradictory. c. Beersheba. 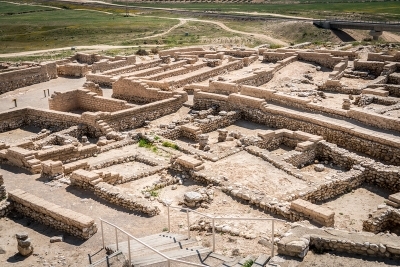 A “genuine” Israelite settlement from the Iron Age. If it is another “Tel” there must be another “Water System” - and indeed there is! For this one you are required to pick up a “hard hat” to protect you as you wend your way through the twisting tunnels. Apart from that this site is perhaps the least interesting of the 3. I visited Megiddo and Beer Sheba. For Megiddo I needed to go twice, as unlike written in the lonely planet the site closed at 3pm! And the cold hearted lady would not let me in at 3.30pm. The site itself is rather unspectacular compared to Masada or Mamshit, but one can imagine how the city must have looked like. The highlight is the accessible irrigation system. Megiddo is about 30min drive from Haifa and easy accessible. Due to its proximity to the Haifa hotspot (Haifa, Acre, Carmel caves) I suggest Megiddo for all visitors with limited time resources. Beer Sheba is smaller than Megiddo, but equally few is left. There is an observation tower in the middle and again the highlight is the irrigation system. My visit was quite pleasant and makes a good stopover on the Tel Aviv - Eilat route. Hatzor user to be a major city spread over an area of 800 Dunam. The site is very much like the one in Megiddo (Armageddon) only larger. It retained an unbelievable underearth water cisterns which for me is the most remarkable discovery at the site. The landscape is beautiful as well. There is a nearby museum of the site at Ayelet Hashahar which was unfortunately closed on our visit. Megiddo is situated on a hill overlooking the Yizrael Valley. The view is beautiful. The site is one of the most important ones in Israel. I found it a bit diappointing though. There isn't so much left of the city (which is typical for such early sites) and the most interesting artifacts were taken away either to the Rockefeller Museum in Jerusalem or to the University of Chicago which was responsible for digging the site. The part best preserved is the water tunnel which is remarkably impressive. It requires some effort in descending about 200 steps but the effort is certainly worthwhile. Ihave been to Tel Hazor three times to dig, 2005 being the last. The water system there is simply amazing, along with the partially-restored palace. To me, it's THE biblical site in Israel. We have visited all three of the listed tels in Israel, plus many more besides. These three all share the fact that the sites were first settled around 5000 years ago, and have experienced multiple layers of occupation since then; in the case of Hazor and Megiddo, around 20 layers, and Beersheeba about 9 layers. Tel Hazor is the most northerly, located near Rosh Pinnah. Buses heading north towards Kiryat Shmona and Metulla can drop you at the access road, but do not get confused with Hazor kibbutz which is several kms south. It is a hot, dry and dusty site most of the time, but there are a number of excavations opened up. To find some shade at the site, you can descend into the water works chamber. There is an interesting museum a short distance away. Har Megiddo (Mount Megiddo or Armageddon) overlooks the Jezreel Valley, and is best accessed by buses travelling between Haifa and Afula. We have been here several times and continue to find it fascinating. Of particular interest are the sunken grain silo, the huge water cistern, and the tunnel (which you can walk through in the shade) which leads to a spring outside the defensive wall. An important occupier was King Solomon, abouth three thousand years ago, who had most of the structures built that can be seen today. The most recent occupiers were the British forces during the First World War. 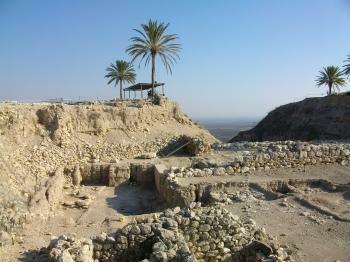 Tel Beersheeba, is about 5km away from the modern city of Beersheva, and is accessible by local bus. It is a large site comprising ruined streets and houses surrounded by a defensive wall, and showing sophisticated water and drainage systems. The site was occupied by the Ottoman army during the First World War, but they were defeated by ANZAC (Australia and New Zealand Army Corps) horsemen in 1917. Stelae: Tel Hazor features many stelae now on display at the site museum. Acropolis: Megiddo - "Megiddo is a massive site, the core of which, the Tel Megiddo acropolis, is under excavation by The Megiddo Expedition of Tel Aviv University Institute of Archaeology"
John D Rockefeller Jr: Megiddo. As per Ancient Thebes the excavations by the Chicago Oriental Institute were funded by Rockefeller between 1925 and 1939. He visited the dig in 1929 and founded the Rockefeller Museum in Jerusalem at a cost of $2 million to display the finds from there and elsewhere in the "Holy Land"
Mentioned in the Bible: Meggido - Josh 12:21, Judg 1:27, 1 Kings 4:12, 9:15- Canaanites to Solomon; 2 Kings 29, 2 Chr 35:29, Zech 12:11 - Josiah killed fighting the Pharaoh; Hazor - Josh 11:1/10-13 - taken by Joshua; Josh 19:36, Judg 4:2, 1 Sam 12:9 - Taken again by Barak ; 1 Kings 9:15 fortified by Solomon; 2 Kings 15:29 - taken by Assyrians, Beer Sheba - Gen 21:31/2/3, 22:19, 26:33, 28:10 - Abraham, Isaac, Jacob; Jos 19, 1 Chr 4;28 Tribe of Simeon; Judg 20:1, 1 Chr 21:2, 2 Sam 24:2 - "Dan to Beersheba" as the "Promised Land"
World Biosphere Reserves: Meggido Biosphere Reserve (Israel 2017)—Renaming of Ramot Menashe Biosphere Reserve. 111 Community Members have visited.